Saint-Lunaire is a small family seaside resort full of charm. At the seaside you can find beautiful sandy beaches. 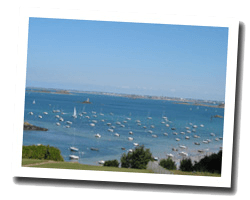 The Décollé headland offers wonderful view of the entire Emerald Coast, from Saint-Malo to Cap Fréhel. The Nick headland, covered with vegetation, offers great opportunities for walks. You can see an exceptional church of the 11th century. 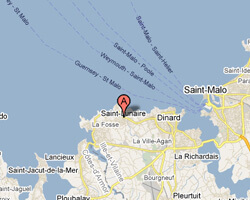 In Saint-Lunaire enjoy a seaview holiday rental. 5 rooms Apartment 130 m2 in the "Le Grand Hôtel residence". Balcony. Nice view of the sea and the beach. Direct access to the sandy beach. This residence, facing the sea, is located in a quiet residential area. Outside: closed garden of 1000 m2. 5 Bedroom(s), 2 double bed(s). short stays possibility. Final cleaning possibility. Price from 720 € to 1600 €. Our beautiful house is located in the popular Breton village Saint Lunaire, in an upper class neighborhood surrounded by beautiful belle époque villas and in walking distance from romantic and authentic shops. This beachfront property lies at 50 m from the local family beach and 800 m from a well-known surf beach. Price from 1220 € to 1420 €.